At our house, books are divided into two lots – tubs of easily accessible picture books and then a shelf of “very precious” books. Obviously all books are precious and should be treated carefully but the volumes on the shelf are particularly special because they have delicate paper engineering or are very old or are special favourites. These are the books I will never part with. Under Cover by Jacque Lynn is one of those special books, blurring the line between story, art and keepsake. 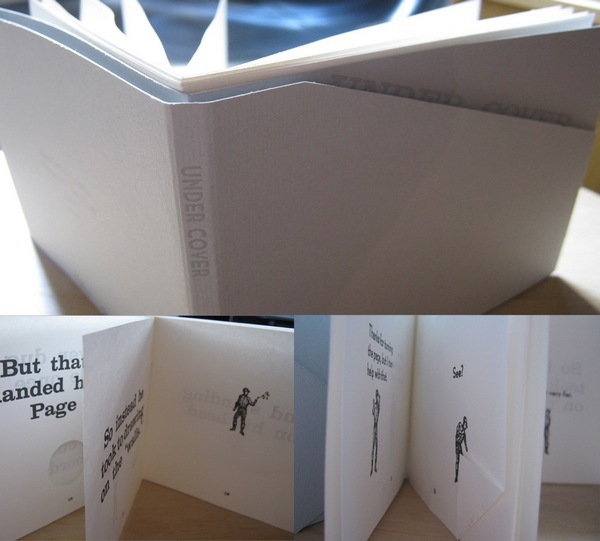 The story is about a little boy who lives inside a book – clever paper engineering is used to show the little boy’s attempts to escape the page boundaries. For Lynn, the story stemmed from the idea of a character literally coming to life. 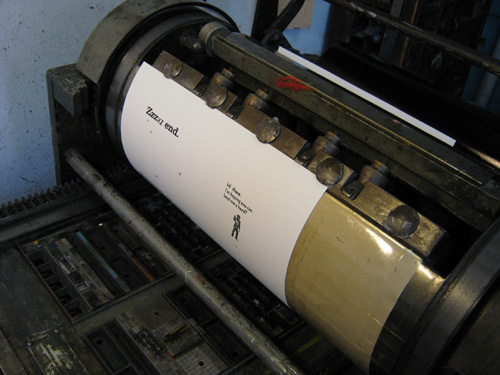 The concept is clever but real book lovers will delight in the carefully constructed book – the handset and bound, letterpress edition is limited to only one hundred copies. Each is signed and numbered. I like the fact that details such as the paper stock (Mohawk Superfine in Egg Shell for the pages and Fabriano Elle Erre in Pearl Grey for the cover) and the typography (Craw Clarendon and Bernhard Gothic) used are listed but then again, perhaps I’m a bit weird to notice (and admire and obsess) over such things! Under Cover is available from Supermarket for US$35 and can be shipped to Australia.